If you own a home, you probably realize you have some precious equity, especially now that home prices have increased for years on end. Put simply, home equity is the difference between your property value and your existing lien(s). So if your home is worth $500,000 today and your mortgage balance is $300,000, you’ve got $200,000 in equity. Those interested in getting their hands on that money can either do a cash-out refinance, take out a home equity loan/line, or sell for a tidy profit. Not so long ago, the opposite was true. Many millions of homeowners were in negative equity positions, meaning they owed more on their mortgages than their properties were worth. For these folks, a refinance was only possible using special government programs like HARP, which were borne out of the crisis, and no cash out was possible. All they could do was lower their interest rate and/or switch from an ARM to a fixed-rate loan. And just what does it mean to be equity rich, you ask? Well, it means your current loan-to-value ratio is 50% or lower, this according to ATTOM Data Solutions, formerly known as RealtyTrac. In a recent release, they noted that 13,125,367 U.S. homeowners were equity rich as of the end of the third quarter, which represents 23.4% of all homeowners with a mortgage. This prized population has increased more than 2.6 million from a year ago, and probably increased from last week thanks to rapidly rising home prices. When ATTOM first began tracking the equity rich back in the fourth quarter of 2013, just 18.5% of the population with a mortgage were in that esteemed category. That equated to just over nine million with LTVs of 50% or less. It has since marched higher and higher and is close to reaching 25%. It’s unclear what the historic norm is or what the recent high is, but a combination of longer tenures and rising home prices have been good to homeowners. Indeed, those who sold in the third quarter had owned their homes for an average of 7.94 years, a new high in ATTOM’s database and markedly longer than the 4.26 year average pre-recession. 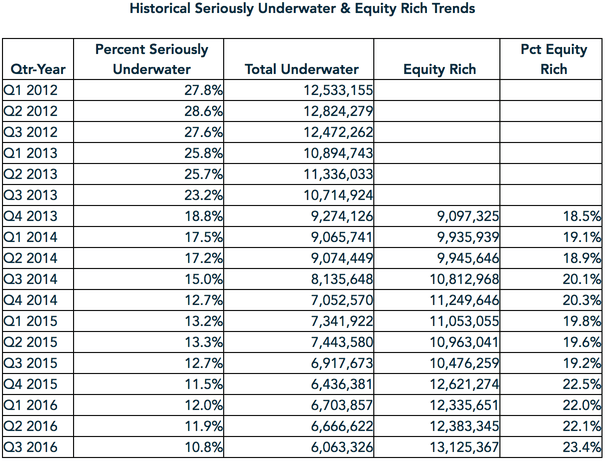 What’s So Great About Being Equity Rich? The beauty of being equity rich is the increased flexibility the homeowner enjoys. For one, they’ve amassed a lot of wealth through home price appreciation and/or the forced saving of paying down the mortgage over time. This means they’ve got a nice nest egg for the future should they sell or downsize. Additionally, it means they’re closer to paying off the mortgage in full, assuming they’re close to retirement and want to avoid steep monthly payments once on a fixed income. Perhaps just as important, they’ve got options when it comes to getting another mortgage. At 50% LTV or less, they will get the best pricing available, all else being equal. So if they want to refinance, they can do so with relative ease and obtain the lowest mortgage rate available. And as noted, they can tap into that equity if they need/want the cash for something else. The equity cushion can also be used for a subsequent home purchase, including a move-up buy where a large down payment is needed. In summary, it’s good to be equity rich, though not everyone is so gung ho about paying down the mortgage early. I should also point out that over six million remain seriously underwater (LTVs of 125% or higher), which represents 10.8% of all homeowners with a mortgage. The good news is that’s 854,000 less homeowners than last year, and well below the peak of 12.8 million (28.6% of all homeowners with a mortgage) in the second quarter of 2012.